This is the first of Degas' depictions of the Opera and has often been seen as marking the final break with his history paintings of the early 1860s. It is essentially a portrait of his bassoonist friend Desire Dihau, who is seated in the centre, in a position that would more normally have been occupied by one of the first violins. Other figures can also be identified: the cellist Louis-Marie Pilet on the left and the double-bass player Gouffe (probably Achille Henri Victor Gouffe) with his back to the viewer. Apart from musicians Degas also included painters and other friends not associated with the orchestra, while in the box on the far left is the almost caricatural figure of the composer Emmanuel Chabrier, a friend of Manet among others. The orchestra is strongly framed by the sharply picked out edge of the stage and the foreground side of the orchestra pit. Other elements, such as the instruments, white shirt fronts and the chair back, add to the compositional order. The dark, dominantly black tone of the foreground figures contrasts sharply with the stage-lit dancers in the background. However, so as not to distract from the orchestra, the dancers are shown cut off at the shoulder. In comparison with the careful finished treatment of the musicians, they are much more loosely brushed to give an idea of movement and to capture the texture of their tutus. As a portrait the work shows Degas' attempt to modernize the genre: rather than the traditional, formal pose of the sitter in isolation, Dihau is portrayed in his usual environment, surrounded by other figures who are as strongly individualized as he. 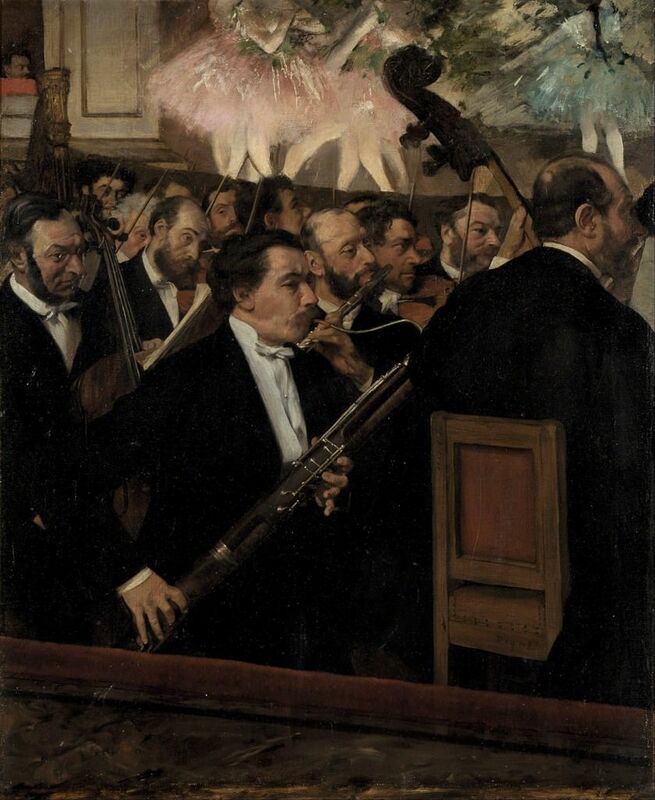 A similar work by Degas is Musicians in the Orchestra, which was originally painted in 1870-71 and then reworked c.1874-6, when the artist added a seven inch strip along the top. This allowed him to show the dancers full length, rather than cut-off as before, and reflects his increased interest in dancers as a primary subject. In contrast to the earlier painting, the musicians are seen from behind and so no longer form the centerpiece of the work.